First of all, happy SUNDAY! I know, I am kinda late with my Thurs-diy roundup. 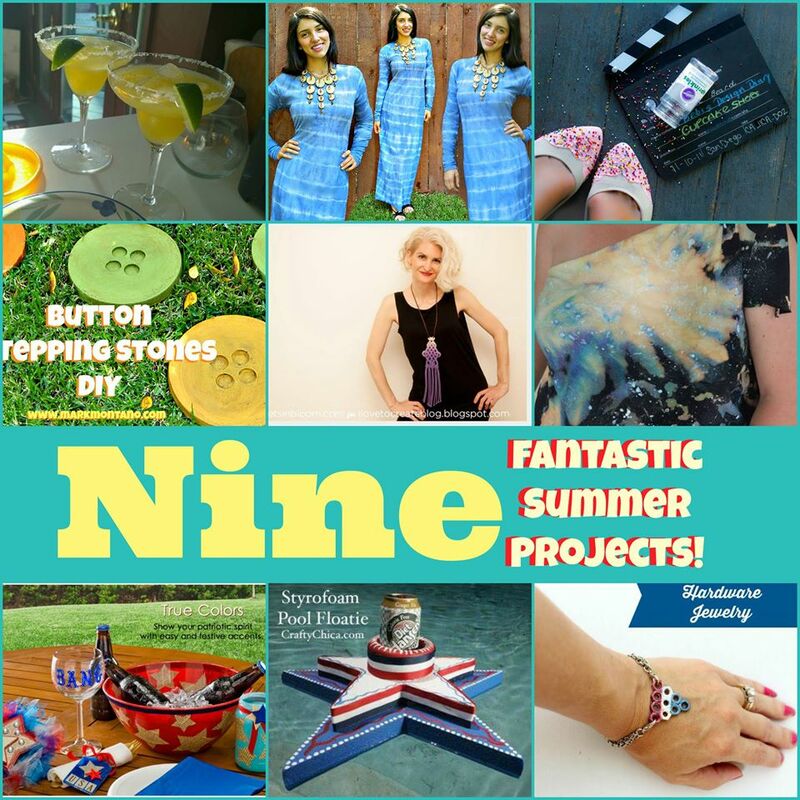 Today I will share nice fantastic summer projects. What can I say I have been chasing and counting stars from one end of my world to the next. It’s kinda crazy how life happens right?!?! Have you seen these roundups yet? I wonder if the universe is looking down laughing saying “HAHAH, hey pluto pass the popcorn”… This will be a good one! Better late than never,right. So coming to you live from JBCC (Jaderbomb’s Crafty Corner) is this weeks roundup. Make sure to check all of them out. 1. Margot Potter shows us how to make a delicious Orange-arita ……..I think I could drink about 48 of these right now! 2. Mark Montano loves buttons as much as I do! You have to make these large button steps! It’s always nice to dress up your yard with fun things! 3. Mark Montano shows us how to make a comfy, cozy beach cover up. You will not guess what he made it out of! 4. Cathie Filian shows us how to deck out any space for a picnic or any patriotic event! You will flip when you see how cute the decor is! 5. If you missed my latest post you will go to the Universe and back. Check out the galaxy shirt I made because you won’t believe how I created it! P.S. knots and ties involved! 6. Cathy Attix always creates the best fashionable items. If you love necklaces and macrame then you have to check this out. 7. Kathy Cano-Murillo shows us how to swim, eat and drink in style with this unique styrofoam pool floatie! The design speaks so loud you might not even need to put a drink in it! 8. Heather Mann made the cutest patriotic jewelry with things from the hardware store. Seriously from the HARDWARE store. Any guesses on what she made? 9. Debi Beard made me these cute birthday shoes with faux frosting and sprinkles. Ok, so she didn’t make them for me but if they are an 81/2 you can just mail them to me. I mean they are THAT cute. Good enough to eat! I know you will enjoy each and every tutorial in today’s post. What have you been doing lately? Any crafts you are working on? \\ I also can officially talk about my partnership with Fiskars! Make sure to read all about it here! \\ We all know that Orange is the New Black is back on. I mean, season 2. Me and some friends did a fun #oitnb roundup and created things based off of the show! Check it out because it’s funny!